Samurai Warriors of the Sekighahara campaign 1600. 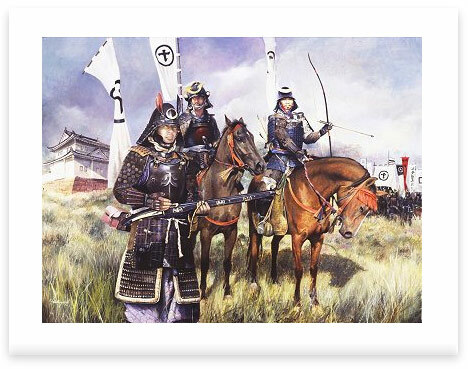 The most important and decisive battle in the history of Japan, Sekigahara was the culmination of the Power struggle triggered by the death of the great warlord Toyotomi Hideyoshi. The two rivals for power were Ishida Mitsunari and Tokugawa Ieyasu. The contest was ultimately settled by force of arms in a small mountain valley in central Japan. By the end of the day 40,000 heads had been taken and Ieyasu was master of Japan. Within three years the Emperor would grant him the title he sought - Shogun. Signed limited edition publishers proof.